Model D10541-000 Dancer Position Card, also referred to as a P.I.D. controller or P.I.D. regulator, is designed for applications where dancer positioning is used to maintain control of motorized operations. This card is also suitable for most any type of P.I.D. regulator or control application. 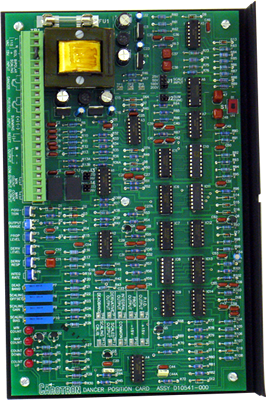 The electronic circuitry utilizes the Proportional, Integral, and Derivative functions to condition the output. Each function can be adjusted independently to control the amount of change in the output voltage. The output of the proportional circuit is a voltage level proportional to the dancer and position inputs. The output of the integral is dependent upon the reference applied to a 12 bit digital analog converter. The converter allows the circuit to ratio the reference input and provide a percentage of the reference as output. An isolated scaling circuit allows optional external voltage scaling of the integral circuit to condition for diameter or velocity changes. The derivative circuit adds to the output during changes in the dancer input. The response and level of the derivative function are independently adjustable to allow for flexible and stable operation. The output of the proportional, integral, and derivative are summed together to formulate the final output. This output can be further modified by an output range potentiometer. A summing input is provided to allow an external voltage to be summed directly with the output. A selection is supplied to change the function, addition or subtraction, of the summing input as required. Positive, negative, and bipolar connection terminals are also available for use.